Sir, you are a Social Critic, and an Anti Corruption Crusader, what have you gained in your fight against corruption? I think I have gained a lot because if I rise and say something in some areas people listen to what I say. You see, corruption has done a lot of damage to Nigeria. Let me start with Benue state for instance, nothing is happening because corruption is on the front burner. Even in Nigeria nothing is happening. We cannot produce even tooth pick in Nigeria. I criticise people who are corrupt because corruption is ungodly, corruption retards progress, corruption is evil and it is destroying our society and ruining the future of Nigeria. And when you are engaged in a war like this, you are bound to have a lot of enemies, people criticise you, people say all sort of things against you, but I don’t care, because I am fighting for what is right, for personal satisfaction and in line with God’s injunction. But you see the situation, there are people who are going about naked, people who are going about without food and shelter, yet there are people who have amassed heavy amount of wealth and are not doing anything with it. Like the ones recovered recently by the security agency. Billions are stashed somewhere while people are suffering. That is why I am keen about fighting corruption, preaching against corruption and criticising corrupt people. I am doing this for personal satisfaction and not for financial gains. I am doing it to redeem the society and I believe in the end it may payoff. Have you any regrets being an anti corruption crusader or a social critic? I regret fighting corruption sometimes, because whenever I do private investigation, obtain evidences and give it to the security agencies, whose duty it is to prosecute people, they don’t do anything, they rather take money and let them go free. That is when I start regretting, but I know that the truth shall always come out. Can you say your voice and others who are in this fight with you, have made Nigeria better? I know that I alone cannot change the system because a tree cannot make a forest, but people are beginning to join in the fight and now we have a president who has zero tolerance for corruption and Nigeria is improving. Look at the money security agencies are recovering now. People are beginning to agree with Buhari, and the country is gaining credibility before other countries of the world like Britain, America and others, who have come to praise the president that he is doing well. I think we have made little impact in this country in the fight against corruption. You served the Nigerian Police and rose to the position of Commissioner, what would you say you have achieved and what was your most challenging case? You see, unfortunately in Nigeria Police Service, we don’t keep records like in advanced countries of the world. In other countries of the world, for instance, if you are a police man and you are doing well they have all your records in the archives for references. All cases you have investigated and prosecuted successfully, they write against your name, and anytime they are making references they quote your work, but we don’t have it here. Here, the best you can do and the worst you can do, – I say the worst you can do because when you have supporters, religious bigots, and godfathers, who will protect you, you are recognised. I have handled many sensitive cases when I was serving in the Police Force, and I don’t know which one is most important. I handled the case of Gloria Okon in Kano, I handled the case of Anenih, Iyamu and others and successfully prosecuted them all. If there is anybody who was under me or above me who has a claim that I was involved in any issue of corruption, let them come out. I also started investigation into the case of Dele Giwa. I went to his house carried out my investigation, submitted my report and sought for permission to go and search the houses of the two security officers who were mentioned in the case, the file went and never came back to me. I also handled the case of two British Pilots, man and woman who came and stole an aircraft in Nigeria. The Late Shogbosun was their defence counsel, and late Justice Ogunlola prosecuted the case, we were able to get conviction in that case. The Aircraft belonged to one Prince Olori, from Delta state. He bought the aircraft, and he did not finish paying, according to the story we heard, so the owner sent the two pilots to come and steal the aircraft from the airport. But somebody who was on the control Tower that day discovered that the aircraft was flown out, but it was not picked on the Radar. As soon as the man at the control tower noticed it, he immediately alerted the Air force, but before they could pursue it, the plane had gone very far. But this man on the Control Tower used his initiative to contact the President of the other country and told him the President of Nigeria said if that Aircraft lands in that country for refueling, they should not allow the aircraft to takeoff again, and that was how the two pilots were arrested. I handled the case and after investigation it was taken to court and the two pilots were convicted. And then what is happening today between the Boko Haram Commanders and the Chibok girls was exactly what happened in the case. When they were convicted our own pilot a Tiv man was also arrested in London when they went to abduct Dikko. He was arrested there so when we convicted these two pilots, it became necessary to have them exchanged. The pilots were then exchanged with our man Akighir. So they did not serve their jail term, but we used them to exchange with Akighir. When I was serving with Force CID, I handled many cases because any complicated case was brought to me. Any case they wanted prosecuted was brought me, except those that they wanted to drop or had no interest. You see, in the force, I was talking and I am still talking that if anybody who served under me in the police, or under whom I served that believed that I was involved in any case of corruption or I destroyed any case should come out. Unfortunately we do not keep records, if we have records my name would have still been ringing bells in the Police Force. We had one detective, John Ville who prosecuted Chief Awolowo and JS Tarka, John Ville was a British police officer a detective, he investigated the case and prosecuted these people at that time, and his name rang bell in Nigeria. Anytime that they were talking about the case they mention him, but this doesn’t happen in Nigeria. The police force in Nigeria does not have any archives. It will not be easy to tell you all the cases I have handled, but I prosecuted many successful cases. There is no case that I handled that was not charged to court. I remember one man called Nwosisi. He was working with Central Bank, and had a brother who was a policeman, his name was Felix Nwosisi. Felix Nwosisi was an Inspector in police. This Nwosisi in the Central Bank had feud with his girl friend, and he killed her. I was asked to investigate. I went to his place, I investigated and they tried to influence me. The case was initially investigated by the police in Benin, Bende state in those days but I think they influenced the police there, and they said there was no case. So they wrote a petition to Force CID where I was serving, so the man incharge of the CID that time, Mr. Pam who later became the Gwangwan Jos, assigned the case to me, I reinvestigated this case, they tried to influence me, but I gathered sufficient evidence and I sent the file to Ministry of Justice for legal advice. The Ministry of Justice advised that with the additional evidence I have produced, it was enough to charge these people to court. I then took these people to court in Benin where the case happened. The case actually happened in Okpana near Asaba. So I took the two people to court and charged them. As soon as the case was charged, the people who were trying to influence me came to the Force Headquarters, and at that time there was this Inspector General of Police who was a classmate to the wife of this inspector Nwosisi at the Police College. They quickly then sent a deputy commissioner of police at that time to come and take over the case from me, but I said the case was already in court. However, they insisted and took over the case from me, they withdrew it and reassigned to a superintendent who was my junior. I was Assistant Commissioner of Police then. That marked the end of case, uptil now nothing has been heard of the case. This was a case involving life and they were hell bent to destroy the case. So any case I handled and I want to say it with any sense of responsibility that if anybody who think I compromised anything should come out now and prove that I am a liar. All the cases I handled, those that they could not influence me and those cases that they were not interested in, I prosecuted them successfully. They did the same thing to me in the case of Dele Giwa. There was another case again where the police changed cocaine into yam powder in Kano. I was asked to investigate and I did my work, wrote the report, they took the case and that was the end. The police men who did this were identified but they allowed them to retire and enjoy their benefits. I have all these records and people have asked me to write a book on my experience in the police service, but I don’t want because the society does not appreciate people who are patriotic, and those who are doing things to uplift this country, so why should I waste my time writing. That is the problem we have in this country. But as for war against corruption, I will never never retard. The only thing that will stop me from doing it is when I am dead. There are many things happening in this country that we are not happy. Sometimes we appoint people in positions to go and fight corruption, but when they get there, they find a way of making money themselves, and they turn round to accuse others of corruption, and nobody said anything about it. I don’t know whether Code of Conduct Bureau is working. I don’t know because people who take appointment should be able to declare their assets and they should also declare when they drop their appointments. The system is rotten and nothing is happening right. You served as Police Commissioner under late General Sani Abacha whose government was regarded as most corrupt. Two decades after his death they are still talking about recovering his loot. What is your personal view of his government? In the area of protecting integrity of this country, I think he did well, because he showed that he was patriotic, but as for the looted funds I wouldn’t say. There was a case that happened during his regime, which my command also handled. The case where one Dr. Omatsola was burnt at the Murtala Mohammed Airport. Dr. Omatsola was Chief security officer at the Murtala Mohammed Airport, he was burnt and he died. There was this allegation that NADECO was responsible for his death. I was Commissioner of Police in Lagos state that time, and the person who was in charge of CID was working directly under me. We investigated the case at the Airport and discovered that NADECO was in no way involved. We investigated and discovered that before the man was killed, he was on duty and somebody telephoned him that he was wanted somewhere, so we were trying to find out from NITEL, who was the person, what number was used and who was assigned that number. And while we were trying to do this, we searched the office of Omatsola and did not find any explosive in the office at the airport. After we had done these things another investigating unit was brought in by another security agency, to come and investigate and they did not come to u or seek our assistance. They went straight to the Airport, and later said they saw explosive, I said it was not true, because if these people were coming to perform a search, and since they knew we investigated the incident they would have contacted us first so that we could go there together, but they went and planted this just because they wanted to involve Professor Soyinka. They were accusing him that he was the head of NADECO he was the one bombing Lagos here and there. So the people who came and tried to destroy this case prepared a press release and brought it to me that I should speak to the press, that it was NADECO that was responsible for this bombing. They gave me the release and when I read through I said no I would not do this because I did not have the same evidence in my case file, if you have evidence give us we will put it in the file and investigate. But to read out what you have written without input from us I will not read it. I thought at that time they will report me to Abacha and he will sack me, so I quickly sent a text to Inspector General of Police, who at that time was Coomassie, and told him the situation. The following day they sent a different security agency, to come and read the statement, then they brought this boy Abubakar, who later became the Inspector General of Police, who knew nothing about the case, to come and read the speech prepared by this security agency. I don’t want to mention the name of the security agency that is why I am calling it like that. He read the speech, and as soon as he finished, I said there would be no questions and answer session. Because I knew what they were trying to do was to set me up, and if I allowed the press to ask questions they would think I am lying. I thought they would report me as a rebel, that I was not cooperating with them and I would be sacked but somehow the case got to Abacha and nothing happened. I reported the conduct of the officer who came and read the prepared speech, I believed I was doing the right thing and they will deal with him, but they didn’t. Rather they went and withdrew the petition I wrote against him, and I think the man eventually became Inspector General of Police. So this is the problem we are facing, people are not honest. People who are not honest are supported and those who are honest are looked at with disdain. So regarding Abacha, on the area of stolen money, I was not in the position to know how he stole it, but according to newspaper publications he stole and this money has been recovered. If they say you stole something and what you have stolen has been recovered then it means you really stole it. But in other areas he did well. He defended the integrity of this country. He did not allow any foreign nations to come and mess up with us. When he was Head of State, exchange rate from naira to the dollar was stable, and the naira had value. Sir, you played a major role in the deposition of HRM late Dasuki, the former Sultan of Sokoto. Are you comfortable with the role you played? I happened to be the Commissioner of Police at that time and anybody could have been the commissioner at this time. But what exactly happened was that we were summoned for a meeting with the Sole Administrator then, we didn’t know what the meeting was for. The Military administrator that time invited us, me, the Director of SSS, his cabinet members and others, he told us that he wanted to depose Dasuki. But when I heard this, I advised him that this man was appointed the Sultan of Sokoto, with an instrument and process, therefore you cannot just come and want to depose him, because if he goes to court he will win. So I suggested that the best he could do is to just issue him a query. If he was issued a query stating all the things he has done, he will try to answer then he can use that. And that is exactly what he did and he was eventually removed. From there he was taken to the Airport, and people who were there did not know what was happening because all his entourage was locked up in the governor’s office. It was after the plane had taken off to Yola that they knew what had happened and they were warned not to cause any trouble. So I had no regrets I did my job as a commissioner of police at that time so I had no regret. If you are in that position and you give me a lawful order, I will carry it out, but if you did not give me a lawful order, I will not do it, if you like sack me, but I know you cannot sack me from earth. It is only God that can sack me from the earth. Can you assess the leadrs Nigeria has produced, who do you think has performed best among them? Let me say this, Shagari would have been the best president but he was also surrounded by thieves. At that time there were people who were selling import licence who became importers of rice, and a series of them which was a situation of corruption they destroyed the government. Then Obasanjo came with good intentions, he established the anti-corruption agencies we thought he was genuine, we thought he will do everything to reposition the country, but he later turned them into his selfish tool to get at people. He was rather using this anti-corruption agencies against his perceived opponents. If he didn’t like you, he will use them against you and they will impeach you. When they brought in this issue of privatisation and started selling government properties, they bought the whole thing, and the person who does that to Nigeria, you cannot say he is a good person. He also played a key role in the destruction of this country. But now Buhari has come, unfortunately his health has not allowed him to run the government the way he wanted, but so far so good he has done very well. Buhari is like a lion, you know when the lion gets into the bush all the animals run away, his body language alone has reformed virtually every person in this country, but unfortunately he too is surrounded by people who are very corrupt. I am sure if he came in this capacity as he had during the military power, all these nonsense would have stopped. But now, he has a problem with his health. He has brought in people who are ruling the country. And some of them who are ruling have many cases of corruption in the court and nobody is saying anything about it. Many of them have files with the EFCC and ICPC and nobody is saying anything, so this has been our predicament in this country. We all have to repent and go back to God, pray to God to forgive us. Take the Murtala Mohammed way. You know when Murtala came back from the war, he was accused of making money in Benin Central Bank, he was accused of building houses everywhere, but when he became Head of State he forfeited all his money, so if our leaders want to be credible let them forfeit their money. Let me join General Akinrinade to condemn attitude of some of senators. How can you have a distinguished senator, and he will come and begin to act like jester, against his fellow senators? When he was accused of certificate forgery and later was cleared, if he is a reasonable person he will be ashamed of himself, but he was dancing on the floor of the assembly. If they really want to help in this country, they should try and cooperate with Buhari, so that they can sanitise this country. The other day I saw one Prof Patrick Olumba, I think he is from Kenya, he came and was presenting a paper to the national assembly concerning corruption. I saw some senators nodding in appreciation of what he was saying. Let them cooperate with Buhari in the interest of future generation, so that this country can develop. Look at what is happening now in Nigeria, we have Kanji Dam and other power generating plants, but we have no electricity in the country, we have spent so much money on the issue of electricity, but we cannot get electricity. Tax payers are not getting anything, everything has gone bananas, nothing is happening. They are importing generators and if you want electricity you must purchase a power generating set. Unless the National Assembly has the fear of God in their heart, and join hands to do the right thing, we cannot make any headway in this country. The worst, is that no matter how you amass wealth, when you die you cannot go with this money, you will leave it here. Like the money they found with this Yakubu, he had a lot of money but he was suffering outside. The money is now with government. If he had used that money to build schools, to tarr roads like Alhaji Chanchagi did, people would appreciate him, rather he stashed the money, the dollars and that forced the prices of goods to go up. He just kept the money, he didn’t do anything with it. If I were the president of this Country, I willl make a law that anybody involved in corruption should be shot. Once you do that, others will be afraid and things will go right. Jonathan was a simple person, he said let my people go, he gave those working with him the opportunity to do whatever they wanted. It was corruption galore, people were doing whatever they wanted, he hadn’t the capacity to stop them. I was not in Aso Rock with him, but they alleged he spent all his time drinking alcohol and somebody who drinks alcohol cannot think rightly. He had no experience in governance. When he started this thing, I personally wrote him a letter and I told him not to contest when he finished the tenure of Yar’Adua, but he replied me that his people wanted him to contest. Now he ended up this way. But he was very lucky because he conceded defeat. If he had not conceded, the situation would have been different and that is why people said he is a distinguished leader, but he is not. All the problems we are facing today he caused it. He allowed people to do whatever they wanted. He allowed Diezani, to do whatever she wanted and the whole system was messed up. When the governor of Central Bank Lamido Sanisu, cautioned him, he did not listen instead, they removed him. In the military, when they came they were not acting with the constitution. They suspended it and were doing whatever they felt. It was a one man show and the problem we are having now was started by the military. The only thing I can commend the military was that, they created states and local governments. That is the only thing they did good and as I earlier said, Gen Abacha protected the integrity of Nigeria. Otherwise they messed up the whole country and looted funds. But as far as I am concerned the sitting president President Buhari is the best. Fulani herdsmen are killing people eall over the country, the worst hit places are Benue and Kaduna, many people regard this as a Jihad, others say they are a terrorist group, just as others think it is mere herders/farmers crises. As a Muslim would you say this is Jihad? It can’t be. Since these people started fighting here and there, have they ever established a mosque anywhere, or have they ever captured a place and established mosque insisting that everybody must go there and worship? You see, when this started we recommended that government should set a committee and call these people to know exactly what is wrong, because until you know what is wrong, you will not be able to solve the problem. In some areas you have rustlers who are stealing cows from the Fulani, to create this problem, in other areas the natives cause it. They collect money from the Fulani people and give them residency rights and in some places like Taraba it is the issue of ethnicity, they reacted when they found out that their brothers, the Tiv people from Benue were sent away, so they attacked them. That is what is happening. What I am saying is that these Fulani people you see going about with cows, the cows do not belong to them, they have people behind them who are owners of such cows. The owners sometimes sit somewhere in cities enjoying their AC, and they allow the these people to take care of the cows and in other cases they stay with such cows for more than one year before they come to give report. Government should set up a commission of inquiry to know the causes and take steps to solve this problem. You know, the Fulani people are very very terrible people, if you steal their cow or you kill their cow or their man they will never forgive you. That is why this thing has became a reoccurring decimal. The only solution government can bring now is to create ranches. If you create ranches cattle movement will be restricted but so long as you allow cows to graze openly, farmland will be destroyed and farmers will not be happy and the problem will continue. If you go to advance countries they have ranches so why can’t we also create ranches. You criticised Akume, almost from the beginning of his administration to the end and even petitioned him to EFCC. Why did you do that, and will you still do that when he comes back as governor? You see I did not know Akume before he became governor of Benue state, but he was friendly to my wife’s elder brother. As soon as he became governor of Benue state, I wrote a letter congratulating him, that was when I knew him. Then, I brought one issue, I said they gave one contract for the supply of equipment to Radio Benue to one Tiv professor, and the Tiv professor and one girl and other inflated the contract by 300%, and these people were investigated by the same justice Kpojime. I asked him to take action on this, but he didn’t that is when I started having problems with him. Everything Aper Aku did he destroyed it, everything. He was just killing, stealing, stealing, and stealing. I wrote, and sent documents to security agencies, they took money and refused to prosecute him. If Akume had done well and if they had prosecuted him, the rubbish which is happening now in the state shouldn’t have been there at all. Suswam refused to take action against him, he drew line between his government and that of Akume. I have no personal hatred on Akume. If my son becomes governor today and is stealing the the way they are doing now, I will challenge him. I do not worship money, I do not worship wealth let people benefit from the truth. The problem we are having now is caused by Akume. Who imposed Ortom on us, is it not Akume? Ortom was with PDP abusing APC calling them a terrorist party, a party of aggrieved politicians, Muslim conspiracy. When Akume brought him to dislodge Jime, he has created a lot of problems. Ortom did not come in with the aim of working. He did not come in with any agenda, he just came and wanted to answer that name, ‘His Excellency, Governor of Benue state’. He has been there for two years uptil now he has nothing to offer. So who caused that, is it not Akume? He has served as governor, and he has been at the senate severally, what has he done to his people? Tarka local government is one of the smallest in Benue state, what has he done there? Wanune, is still a village, after he served as governor two terms and senator for three terms. Why should I support a person like that? When his brother died, he went and put Solar light where he was buried. What can solar light do to dead man? Instead of developing Wanune to become a satellite town, he coundn’t do it. He has not done anything to help his people, so a person like that why should I support him. I will not do a thing like that. On President Buhari’s health, don’t you think it is preventing him from carrying out his responsibilities? Don’t you think he should resign? Why should he resign? Some countries had presidents with stroke, but they didn’t resign. A president in America too had stroke and was on wheel chair, but he did not resign. Presidents of other countries too had health challenges, but they did not resign. President Buhari is not going into a boxing ring to fight, all he needs to do is give directives, so there is no point for him to resign. On the Chibok girls, where exactly where the girls moved from, whether within Nigeria or outside the borders, why this batch of girls were received behind closed doors, why is federal government shielding the girls from the media among other questions, has remained a mystery. Don’t you think there is something wrong with this arrangement? I don’t think so. If Jonathan had wanted to negotiate to swap these Chibok girls, he would have done so. You know one of the lives of the Chibok girls is more valuable than the life of any of the insurgents or the Boko Haram commanders. But here you have over 200 girls in the hands of the insurgents, but some were rescued and now 82 others. I understand, in newspapers that they exchanged them with two commanders of Boko Haram, and as far as I am concerned, this is quite reasonable. Instead of allowing these girls to die, then we keep these people, in prison, feed them, try them in the court then convict them, it is better to save the lives of these young innocent girls. That is how a country can show that it loves its citizens. I see nothing wrong with it. There are still some girls held by the Boko Haram, if government comes out to say everything about these girls who have been rescued now, it may spoil our chances of getting the other girls, and they will think that they were not sincere. As far as I know this is a security matter that does not need to be discussed publicly like this. I support the government 100% for what it has done. Sir, Governor Ortom has declared a State of Emergency on payment of salary, What is your reaction on this issue? Let me tell you this, Ortom does not know the meaning of state of emergency. Maybe he heard they say it at the national level so he picked it up. If he wanted to declare a state of emergency, he would have done it, when he received loans and bailout from the federal government, so that he would use that money to clear the salaries, but now it is belated. He has given some contracts, and paid them upfront, like the one I wrote about in Gbajimba. It was given for N4 billion, then about N1.7 billion has been paid and he has connections with the contractors. There are other contracts he has also awarded and paid huge sums of money, but if you go round, nothing is happening there. So what type of state of emergency is he declaring now? Is he going to recall these monies back to pay the workers? He had the opportunity to pay but he could not. He rather was concentrating more on his farm. Go to his farm and see, he has Chinese working with him in his private companies, he has a lot of machineries there, but go to the state ministry of Works or Agriculture, nothing is happening there. If there is any action, the action is for his private business. He has taken over everything, his paper receives adverts from government but The Voice is dying. When Tor Tiv was to be crowned, it was only Oracle Press that printed everything. The man is deceptive, he is only here to make money. People come into leadership because they want to impact positively on the lives of the people, not because they want to come and enrich themselves. But Ortom is only here to make money. There are other things that I have put together, I want to copy him and give to federal government so that they will investigate him and see what he is doing. He has gone to China several times, what has he brought? The other time he went to China, came and went to church in Lagos and said some people are coming to invest but where are they? He went to China on a jamboree and wasted our money and what has he brought to show for it. But people are afraid to talk, they say if I talk they will beat them or kill them or not sponsor them, but I will talk, let them kill me I am already ripe for death. Because he hears about a state of emergency somewhere, he wants to talk about it here. The man is like a parrot, if he hears about anything, he will just talk without knowing the meaning, he talks without reasoning. You criticised Akume, now Ortom, but refused to criticise Suswam, is it because he was giving you tips or he made you Amirul Hajj? We’ll, let me say that Suswam did his best. When Akume was governor here for eight years he lived in boys quarters. Suswam came and built the governor’s lodge, established a good office befitting to a governor, build schools, constructed roads. He could not perform in his last four Years because of his judicial case. He spent three Years in court. Akume was staying in Boys Quarters and was using a fetch and flush toilet. He Ortom, came and is enjoying the structures built by Suswam. Ortom is a liability to Benue state, when you compare with what Suswam has done. Ortom himself described Suswam as Mr. Infrastructure. He said that if somebody takes over from Suswam, he will have nothing to do because Suswam has done virtually everything. It is the same person who today want to prosecute Suswam. I respect Suswam not because he made me Amirul Hajj. The first person that made me Amirul Hajj was Akume. When he made me Amirul Hajj and I went to Mecca and I came back, he said he wanted to make me chairman of Muslim Pilgrims Welfare Board but I rejected the offer. I said people who are already there are still doing very well so they should continue. Moreover the duty of Amirul Hajj is performed only once a year, when you go to Hajj. The duty of Amirul Hajj is when you go to hajj, they give estacode, and when pilgrims are in problem, you used your money to solve their problems and come back your job ends there. Yes, spiritually I gained much, because I went for a spiritual journey, came back and was able to do good to people. I was not on fixed salary and I was not even on allowances, so what big job has the man done that I will kneel down for him. Suswam is very good man because if you give him advise, he will take it and if he is not going to take it, he will not argue. His approach to security issues too was very good. It was during his time that he established Operation ZENDA, and they were doing very well until when he left office before they became notorious. He established them here to bring about peace in the state. During Akume, there was insecurity everywhere. They were killing people left, right and centre. They killed some youths in Tarka local government area and nothing happened. I protested against the killing to Human Rights Commission. If you compare these two people with Suswam, you will see that the difference is clear. 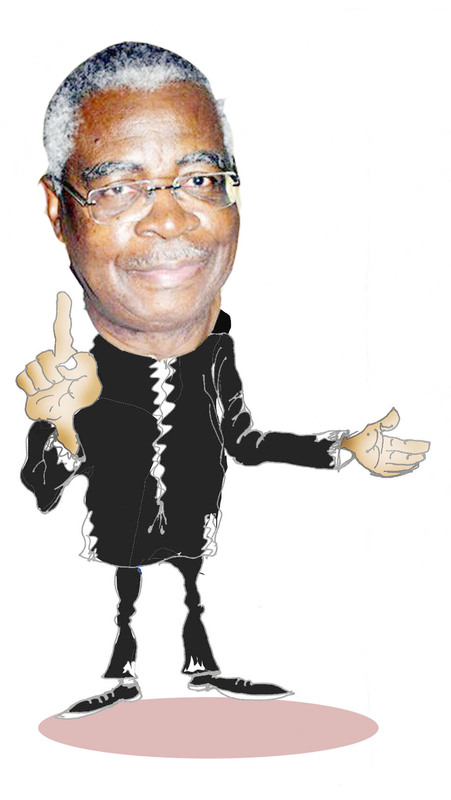 My son is a lawyer, he is Suswam’s senior in the bar, so what can he do to me. Suswam is humble and he takes advise. But the man who is here now is deceiving us with the Bible. He talks about the Bible, but he acts like a devil. We had Rev. Fr. Adasu who was Governor of the state and was a priest, but he never spoke about the Bible like Ortom. He came and said he wanted to unite the people instead he went and sewed a red cap. You can’t unite people by the clothes you wear, but by being friendly with them, treating them fine and giving them equal opportunity, not by sewing a cap and saying that it is cap of unity. He is using that to destroy the Tiv and Benue culture. Are you a Tiv man or you are from Kano as alleged by Governor Ortom? Laughs I am a Tiv man, I was born and breed in Gboko. If you go to Mkar, my placenta was buried there. My father is from Vandeikya, I have a village, and I have my relations there. He is not even competent to say that because I am older than him.